The slogan at MeetLocals.com is “Casual dating, flirting and more”, so singles can look forward to a site offering fun, chats and cool dates, and boasting more than 3 million visits each month - it is not difficult to see why. There is a real Facebook-feel to this site, as you are encouraged to add friends, share photos and view profiles. In addition, unique features such as the “Who’s Cute” voting game on members’ picture will keep you entertained. With an emphasis on direct interaction with other members, it is no wonder that there are plenty of options to get in touch with users. You can choose between the standard options of private message, instant chat, “winks,” plus video chat and live camera action. Meanwhile, the “Flirt Center” gives you the chance to select introductory messages to groups of multiple users at once. Staying in touch with people once you do make contact is made easy, thanks to the “Members Updates” stream, which acts as something of a Facebook status update forum. Meanwhile, playing “Who’s Cute” by rating profile pictures will both keep you entertained and see you rewarded. The more you vote, the greater the chance of your profile being highlighted. And you can sit back and enjoy the MeetLocals blog, which covers plenty of dating issues. Getting started at MeetLocals.com is incredibly simple and will only take a few short minutes. You will initially be asked to submit basic personal details such as gender, e-mail address, password, city and age. You will then have the chance to upload a photo and be asked to fill in the section “What are you looking for?” You are required to simply tick boxes expressing your preference when it comes to race, hair color and body type. Finally, you will be sent a verification e-mail. Just open the e-mail, click the link and you are ready to go. User security is taken seriously. And so MeetLocals safety standards include the requirement to verify your photos by presenting photo identification to site administrators. This is a significant step towards weeding out potential scammers. You are also given a high degree of control, as you can make your pictures visible to friends only if you wish. And if another member is bothering you, you can block them from contacting you again. You can sign up as a free member at Meet Locals. However, this limits you to restricted usability and so if you want to take the initiative and contact other users, or view profiles in full, then you will need to pay for membership. You can do this on a trial basis – A 2-day trial costs just $1, while a 7-day trial costs $9.95. If you wish to then commit to a longer period, then a single month will cost $34.95, a 6-month deal $11.65 monthly and an 18-month package has an overall cost of $119.95. However, it is well worth noting that there is a 3-month guarantee, which means that if you don’t date within 3 months, then you will be handed 3 months’ membership for free. There is plenty going on at the site, but the interface and design is extremely well organized. So on your personal dashboard, there are clearly marked sections for you to update your ‘status,’ see what others are doing via the “Member Updates” and “What’s New” which includes new messages. Meanwhile, there is direct access to the search function, photo galleries and live webcam action. There are also some useful tools to make your usability as straightforward as possible. For example, you can see exactly who has viewed your profile and it is also possible to create a favorites list to keep track of anyone who catches your eye. And there is no need to miss out just because you are on the go, thanks to the meetlocals mobile app which is available on Google play and iTunes. Finding suitable matches is not a problem. As soon as you arrive at your dashboard, you will be asked if you wish to add a list of possible matches to your friends’ list. 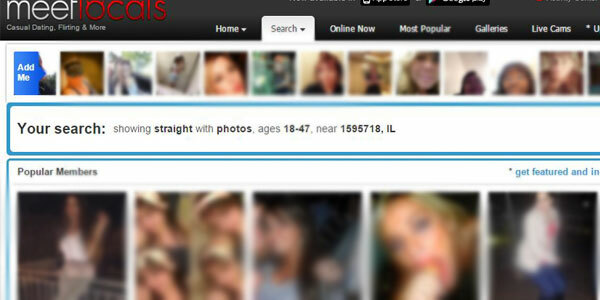 At the same time, you will be shown who the “Top Hotties” are in your area. However, if you wish to search for yourself, there are two options. The basic search allows you to find someone using broad criteria such as location, gender and age. Meanwhile, the advanced search provides much more flexibility, letting you search based on profession, religion and even sexual preferences. Usefully, it is also possible to search via a keyword. And when your search results produce someone you like, you are just a click away from sending a private message, instant chat message or adding them to your favorites. This is the ideal dating site for flirty fun. It you are looking for a more serious relationship or life partner, then you may be better off reading our review of Zoosk.com. However, Meetlocals is full of engaging features, simple to use and will match you with fun-loving people in no time.